The United States held Italy to a 1-1 draw in an ill-tempered match in Kaiserslautern while Ghana scored an astonishing but well deserved 2-0 win over the Czech Republic in Cologne. Italy defeated Ghana 2-0 and the Czech Republic beat the United States 3-0 in their first-round matches. Saturday's results put Group E open and every team will wait until the last match for their fate. Portugal, who beat Angola 1-0 in their opener, qualified for the knockout stage after easing past Iran 2-0 in Frankfurt. Three players were sent off by Uruguayan referee Jorge Larrionda in the US vs Italy match, in which a loss could keep the United States out of the next stage. Italy caught the US defence flat-footed as Andrea Pirlo's in-swinging free-kick was headed into the bottom of the net by Alberto Gilardino in the 22nd minute. The United States pulled it even thanks to an own goal five minutes later, when Bobby Convey's free-kick from the right evaded everybody until Italian defender Cristian Zaccardo shinned it into the corner of his own net. The two sides failed to score in the second half even though both fought hard in search of a winner. US coach Bruce Arena was delighted with a point. "It's fantastic to get a point from the match. We want to stay alive and we know that four points will enough to put us through from the group," Arena said. "It's a crazy match. We were nervous today," said Italy head coach Marcello Lippi. "The own goal and the Rossi's red card made us more nervous. Obviously I am not satisfied with the draw." 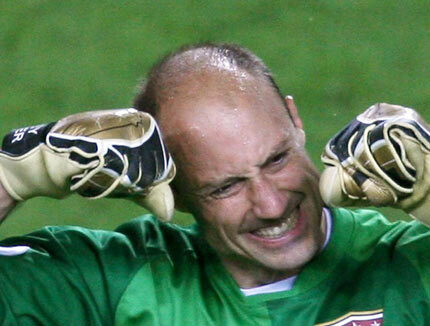 US goalkeeper Kasey Keller, who was named Man of the Match after the match, was their team's No. 1 hero, producing a stunning display of goalkeeping to help earn his side a point, particularly in the second half after his side was reduced to nine men. The pick of his saves came in the 73rd minute when he denied Alessandro Del Piero with a one-handed save at full stretch. Italy midfielder Daniele De Rossi was the first to be sent off in the 28th minute for throwing an elbow at US striker Brian McBride on the halfway line. McBride, who plays with English premier league side Fulham, suffered claret all over his face but he went back on his feet and returned to the pitch after being cleaned by the physios. The US side was also left 10 men on the pitch in the final minute of the first half, when Pablo Mastroeni was shown the red card for a lunge on Andrea Pirlo. His studs caught the Italian on the ankle. In the 47th minute, the United States were down to nine men. Defender Eddie Pope caught Alberto Gilardino and received a second booking and his marching orders.